This in part thanks to a Taiwan firm, Yi Tien Electronics… but wait, there’s more! 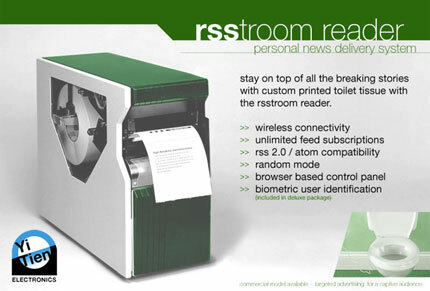 Get this: When you sit down, it knows who you are by biometrics and prints out the news you want (instead of what your significant other or room-mate likes to read)! …most likely it’s a hoax, but if find someplace where you can buy one of these things, let me know. I’m flushed with excitement over this idea. It just wipes me out. At least if you were reading this blog in the can, you’d know the quality was as good as the paper it’s printed on. I am so proud to be privy to this announcement!